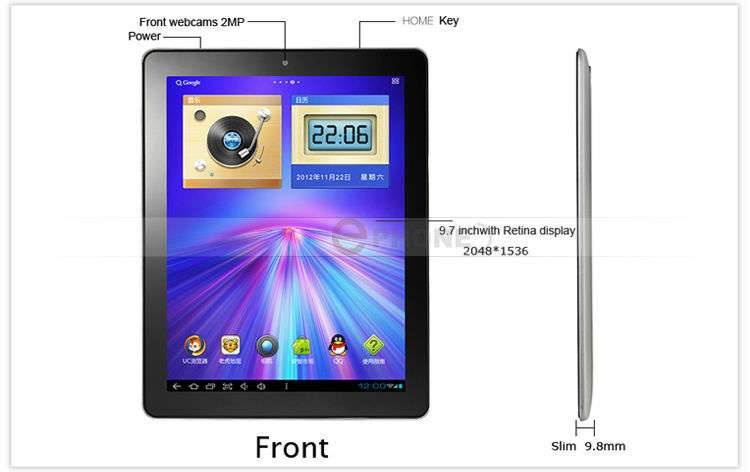 The aim of the Onda V972 on 5 December the first 9.7-inch tablet with a "retina display" Allwinner A31 and the new quad-core CPU are presented. The device will reportedly cost well under $ 300 and is intended to Android therefore come 4.1 "Jelly Bean". Nor has the Chinese manufacturer Onda back with specific details about the device, because the day after tomorrow is the official launch press conference scheduled. The device is based on Allwinner A31 ARM Cortex-A7 processor to come up with four cores and a graphics unit Octanuclear type PowerVR SGX544MP2. Supposedly, he can ensure that the graphics performance of the Nvidia Tegra 3 in the shade and at least close to the new iPad position, where the clock speed of the CPU and other details available so far only a few details. The power should be sufficient in any case to use the 2048 × 1536 pixels dissolution amount of IPS displays at Onda V972. Other features of the Onda V972 include 1 GB of RAM and 16 GB of flash memory, N-Fi, microSD card slot and supposedly a camera where you want it to be the same model, which is also embedded in iPhone 4. The battery has a capacity of 8000mAh and thus should allow 8 to 10 hours of run time. It's supposed to go already priced at around $ 200, which also prices of nearly $ 270 be called. Official Info's are after tomorrow. 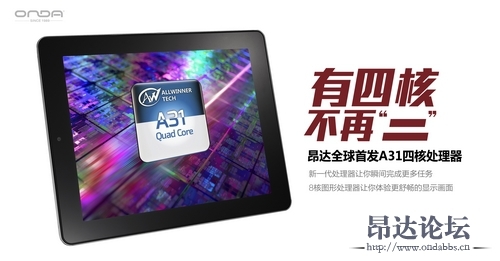 One more thing to Allwinner A31: This chip will meet us in the near future more and more devices and has through its arrangement of two pairs of type core ARM Cortex-A7 work theoretically more effective than actually better chip based on ARM Cortex-A9 architecture.